OK, MY TAKE ON HESHY RUBIN'S "LET THERE BE PEACE"
1- WELCOME- I LOVE THIS TUNE! CUTE SONG...SORT OF LIKE AN INTRO TO WHAT THE TAPE IS ABOUT..
7-WE HAVE THE HAILIGE TORAH- GREAT LYRICS..(THOUGH I WISH IT COULD HAVE BEEN LONGER .).. MESSAGE OF "TOIV LI TORAS ...MEIALFEI ZAHAV.." TALKS ABOUT SUCCESFUL, RICH AND POPULAR PPLE....(FORD, BABE RUTH, SHAKESPEARE...)AND ABOUT HOW MUCH MORE WE HAVE BY HAVING THE TORAH... THE CHORUS HAS AN OYOY PART...(SOUNDS LIKE A BUNCH OF YESHIVA GUYS) WHICH TIES IN PERFECTLY..
9-A MILLION WHITE HORSES- BASED ON A MIDRASH, THAT IF ONE SEES A WHITE HORSE IN A DREAM, PEACE BE WITH HIM.... ONE OF MY FAVORITES ON THIS ALBUM....GREAT TUNE. ALL IN ALL, IT'S A GREAT TAPE, BUT YOU CAN'T JUST PUT IT ON AS BACKGROUND MUSIC...YOU'VE GOT TO REALLY SIT DOWN AND LISTEN TO IT...IT'S POWERFUL! I don't think the selling has anything to do with it. His lyrics, like you said, are just too simple, and yes, I believe that some of the words are just plain corny. 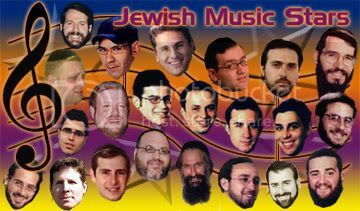 I also think that Leib Yaakov Rigler or Jeff Horvitch has more creativity than Yaron.